This article aims to talk about the solution for C drive resizing when Windows Server 2012 reports low disk space warning message. Download IM-Magic Partition Resizer Server to increase the size of C drive when receiving low disk space alert on Windows 2012. 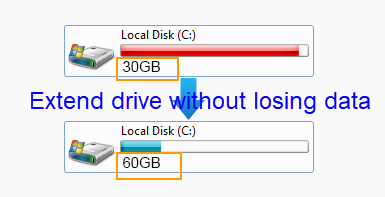 Want to increase size of C drive when it is running on low disk space in Windows Server 2012? A third-party partition software is helpful with partition resizing so that you can fix the low disk space problem easily. IM-Magic Partition Resizer Server is specialized Server partition software, with which you are able to extend C drive system partition, shrink partition and move partition without touching any of data. This partition software supports to increase size of C drive whether it has NTFS or FAT32 file system without rebooting your computer. "My PC was running in Windows Server 2003 operating system, but I have updated it to Windows Server 2012 operating system this morning. After reinstalling operating system, Windows Server 2012 reports a message that C drive is running on low disk space. I have checked the Properties of C drive and found that there is only about 1GB free space on this partition. I am wondering if there is any way to increase the size of C drive without reinstalling system." I had installed a 160GB hard disk on my PC which runs Windows Server 2012 OS, but recently the C drive is nearly full and I frequently receive low disk space warning message. So can anybody tell me if it is possible to fix the low disk space warning? What should I do if I want to increase the size of C drive? How to Increase Size of C Drive in Windows 2012? Windows Server 2012 operating system has Windows built-in partition manager, with which you can resize hard disk partition and reallocate disk space. You can open Disk Management on Windows Server 2012 and extend volume. If C drive is not system partition, you can also run Diskpart command to extend C drive on Windows Server 2012. Adjacent unallocated space is always needed in order to increase size of partition whether you want to rely on Disk Management or Diskpart command. However, both of them have some limitations to create an adjacent unallocated space. Therefore, you can also rely on the partition software when you are unable to extend the partition with help of Disk Management and Diskpart command. 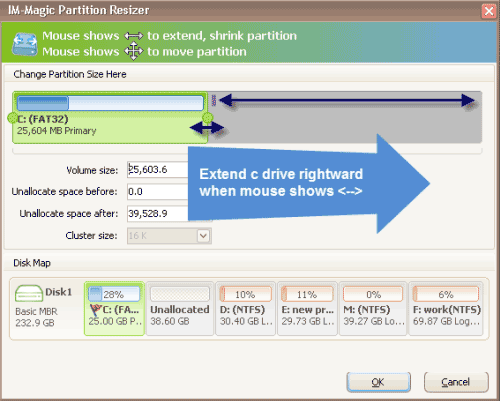 If you can use the partition software to resize C drive, it has no limitation. The IM-Magic Partition Resizer Server enables you to move free space from another partition to C drive without touching the operating system or disk data. You don't need to reinstall system or move any data from C drive, but you can easily increase the size of the partition as long as there is free space on the same hard disk. By using this partition software, you can resize C drive on basic disk and RAID 5 array. If C drive is running on low disk space on RAID 5 in Windows Server 2012, this partition software even allows you to add new disk to increase the size of C drive if there is no free space on RAID 5 array. IM-Magic Partition Resizer Server is also compatible with Windows Server 2012 R2 to increase size of C drive when running into low disk space problem. This partition software can work with all brands of hard disks so as to help with C drive resizing. In addition, this partition software also enables you to increase the size of other partition. For example, you can extend a data volume by moving free space from C drive system partition. This partition software is completely safe and reliable, which will not cause any damage to operating system or data.